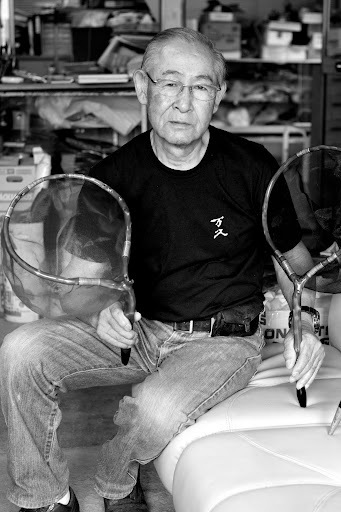 In 2011 I was privileged to spend a couple of days learning the craft from Yoshimura-san, and learning more about the nets and his history. It wasn’t very long but was certainly invaluable time with the master. Yoshimura-san had been asked to participate on several Japanese TV shows and to give interviews to magazines in the past but always refused. He didn’t feel the need to be on a TV show, nor did he want the attention of people who weren’t so interested in truly learning his craft. His business thrived solely based on the reputation of the products he made. For the first time he had allowed someone to come in to interview him and film him making and perfecting the tenkara nets at his store and workshop. Mr. Yoshimura passed away almost exactly a year after my visit, in May of 2012. I had promised him that I’d return this year to work for free even. It was a true wish of mine that I’d have a chance to be more of an apprentice to him, and to have gotten to know him better. He was a very genuine person, passionate about teaching his craft to anyone who really sought to learn it. He welcomed me openly and even in such as short time together I could say he was a mentor. Very regretfully, I didn’t keep in touch with him after my visit. I really should have; I really wish I had. It was heartbreaking when I learned from Mr. Amano that Yoshimura-san had passed a few months earlier due to a stomach cancer. He looked very healthy when I met him. I hope this short film is a tribute to the craft he passionately took up 45 years ago, and most importantly to the memory of Mr. Yoshimura. Sounds like Mr. Yoshimura was one of those rare individuals skilled at his craft but humble and not needing the adulation of others. You were lucky to have met him. Great video always and sad to see a legend disappear. An honorable post Daniel, I feel proud to have made a couple Tamos. But now even more than before after reading this Blog entry. Filled my heart with honor. Now we will all have to figure out more Tenkara secrets on our own. Daniel I think introducing the Tamo to others will be a good way to pay tribute to the great Tamo maker Mr. Yoshimura. I will always think of this while making my nets. Thank you all for the comments so far. Indeed I think sharing the craft is a way of paying tribute to him and generally a tradition that is so small it wouldn’t be hard to be forgotten. Perhaps he sensed it was time to share the craft with others by letting me come in and film him. I really wish I had more footage of the time with him, but I am happy this was recorded. I wish that I could have had one his nets, they are truly a work of art. I am currently making my own net out of a maple branch i found.